A rare combination: colorful rhythms and intriguing percussion from guitar whiz Jay Finkelstein,an anchor of the Puget Sound contra realms, and Julie Bennett’s full press drum zoo. And fiddle tunes from all the Celtic islands, played with panache. 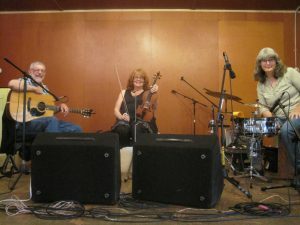 MAKING TIME:Terry Wergeland, accordion and piano, Joe Micheals, guitar/ bass, and fiddle Susan Burke. Lots of room for improv and groove here. 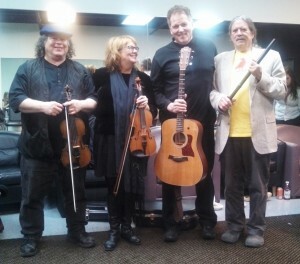 A quartet of Susan Burke, fiddle, Howie Meltzer ,fiddle, Chuck Pliske, piano/concertina, and Joe Micheals, guitar/percussion make Red Crow’s chemistry one of a kind. 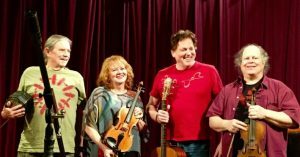 Red Crow’s soaring twin fiddle harmonies pair with inventive rhythm groundwork loved by West Coast contra dancers.New melodies and traditional Scots and Irish tunes are matched with each dance, and for more than a decade, they’ve played their hearts out together. Almost a hundred combined years of dance music experience in this group! Red Crow brings the groove to dancers from Eugene to Vancouver, B.C., and is available for contra dance bookings throughout the Northwest.
. “They let fly satisfying tune sets with a lively “just right” (not too fast, not too slow) tempo and musical phrasing that served to keep us birds of a feather flocking happily together on the dance floor.”—Vancouver’s St. James Square contra dance.